(Left to right) AASP/NJ Board Member Ted Rainer, Mike Anderson of Collision Advice, Executive Director Charles Bryant and President Jerry McNee. 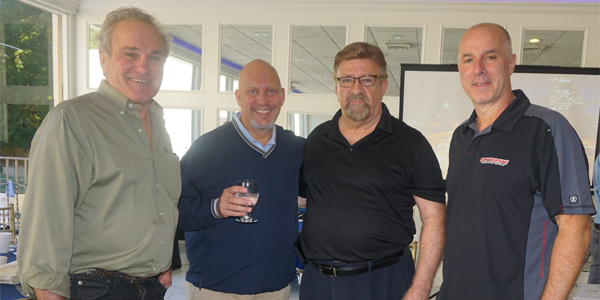 The Alliance of Automotive Service Providers of New Jersey (AASP/NJ) welcomed industry expert Mike Anderson (Collision Advice) and friends on Sept. 29 for a motivational and educational program that attendees found to be both powerful and entertaining. The event, which was held at Gran Centurions in Clark, N.J., was well attended by AASP/NJ members and non-members. Joining Anderson for this presentation were Dennis Rogers, strongman and Guinness Book of World Records setter; Ryan Taylor, CEO of Bodyshop Booster; and Brett Steele, regional sales director of Podium. Anderson left no stone unturned as he went through every crucial industry factor that is important to today’s automotive technician. Anderson and crew discussed how to effectively communicate to customers and also staff members via online and mobile tools. He shared personal tales of strength that serve as a reminder that one can accomplish just about anything. Anderson found that employees take unkept promises to heart, and that causes distrust. He advised all to return to their shops and ask their staff members if they ever felt they were steered wrong, then asked how attendees could make it right. Anderson walked attendees through a detailed and thorough discussion of how to utilize online tools to improve one’s business. He showed them what consumers are looking for when they access the web to search for an auto body shop. “Customers want to see what your business looks like from the street,” Anderson said as he displayed the types of images their Yelp and Facebook pages should include. He also revealed that 36 percent of consumers today want to do business when a shop is closed; therefore, it is key to make use of tools that will allow customers to communicate with the shop and schedule an appointment through the company’s website or a mobile app. As for the fear of negative reviews that may come, Steele said this can be easily fixed by responding to the review. This shows future customers that the business cares more about customer service than it does about being right. Bodyshop Booster’s Taylor demonstrated how to effectively market one’s business to reach the audience it seeks. “It doesn’t matter how much money you spend on marketing, if it doesn’t apply to that customer, they will dismiss it outright,” said Taylor. Technology is here to stay and more advances are underway. Therefore, it’s important to spend time now on things like improving a shop’s WiFi, technology and training in these areas, Anderson said. It is believed that by 2020, 70 percent of estimates will be processed via virtual app or photo. Everyone has the strength to be whatever they want to be, Rogers said before he performed a series of strongman demonstrations, wowing the audience as he straightened a horseshoe, bent a steel rod, broke a wrench and rolled up a frying pan with nothing more than his two hands. As a young boy, small and only 88 pounds, he was bullied and never thought of himself as more than a wimp. Accidentally, he discovered he had been blessed with the gift of strength. Today, he performs feats of strength on national television and has earned the respect of some of his heroes, including Arnold Schwarzenegger. Closing out the program, Anderson encouraged all to take the quarterly “Who Pays For What?” surveys he sends out and to attend his free OEM webinars, which are available at collisionadvice.com. For more information on AASP/NJ and upcoming programs, visit aaspnj.org.